Could your iPad become your primary Logic controller? Perhaps the most notable thing about Logic Remote, Apple's new Logic Pro iPad controller app, is that it's taken so long to arrive. You'd have thought that the company would have been one of the first to offer a touchscreen control solution for its famous DAW but, up until now, it's been left up to third parties to provide it. 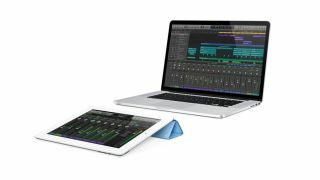 It seems that Apple was just waiting for the launch of Logic Pro X, though, the new version of the software that's finally arrived. Logic Remote was released on the very same day, and it looks pretty comprehensive. It enables you to play Logic's instruments (via interfaces that are reminiscent of the iPad version of GarageBand), navigate your projects and mix your tracks. Full specs and a few demo videos from macProVideo.com are below. You can download Logic Remote for free from the Apple App Store - it's compatible with the iPad 2 or later and the iPad mini.